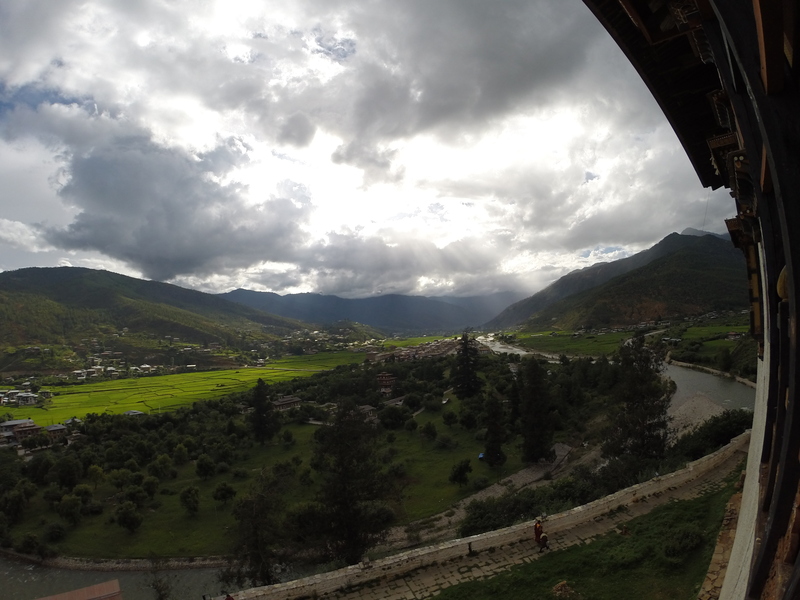 If you haven’t read our introduction to Bhutan (part 1), you can find it here. To read about Thimpu and Punankha (part 3), click here. 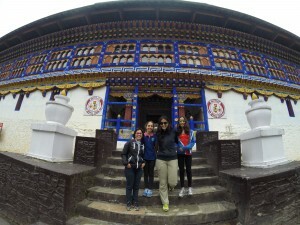 After having been greeted at Paro Airport by our tour guide and driver, we started our tour straight away by visiting Paro. First impression: WOW, what a magical place! The grandiosity of the lush green mountains that our plane hovered so closely with beautifully manicured homes & temples sparse by the river in the valley make a breathtaking sight. Paro is the second biggest city in Bhutan but it follows Thimpu (capital) by a long mile. The town is comprised by a big gorgeous Dzong(fortress) and a main road where all the shops, restaurants and guests houses are. Other than that, little pockets of houses and small hotels disappear through the valley. All the constructions follow the same traditional Bhutanese style making every street an interesting sight. Our hotel- a former royal residence – was slightly higher than the river level so we had a great view of the town and Dzong. Tiger’s Nest Monastery: by far one of the most amazing sights we’ve ever visited. This temple & monastery is set in the middle of a mountain and to this date still houses tens of monks learning Buddha’s teaching. It is quite a hike up there but it is totally worth it. The guide said that the fittest can go up and down in 3hrs but we took almost 7hrs with a couple of stops for tea & lunch. Rinpung Dzong (fortress): it was the first Dzong we had seen and for sure it made an impression. The architectural details, courtyards and paintings on the wall were impressive. The hotel – Gadgety Palace: such a beautiful building with traditional bedrooms and great view. They also have a hot stone bath which was an interesting experience that I shared with my cousins. It is literally a wooden bath that they fill with water and herbs. The heat comes from the stones that are heated on the fire outside and then put into the bath. It was fun! Ta Dzong (Museum): in this small museum you can see the different masks used in the festivals and understand more about the culture, flora and fauna of this spectacular country. Farm house dinner: a slightly weird set up but certainly eye opening – we got to have dinner in someone’s house and eat like locals. We didn’t particularly like the food but it was interesting to see the simple standards that people live in. The particular one we went was also a guest house so watch out if you plan to stay in one of them – you will end up sleeping on a mattress on the floor. On day 3 of our tour, we departed Paro through The most sinuous road I have ever seen in the direction of Haa Valley. The road took us up a mountain that finished at Chele La Pass and then down the other side to reach Haa. In retrospect, we should probably not have bothered with the painful drive for what we saw on the other side but we made the most of it. Chele Le Pass is quite a magical spot with white and coloured flags all over the place. These flags are placed by the people as wishing (coloured) or in respect for the dead (white). Haa Summer Festival: even though it was much smaller than what we expected and it poured rain for a good couple of hours, we really enjoyed been in a less touristic village to see the traditional dance, music and food stalls. A photo with the minister! Our Hotel (Soednam Zingkha Guest House) and the valley itself: this was a refurbished traditional Bhutanese home that was set in a beautiful spot at the Haa Valley. The place was very nice and the location was perfect. I wish we had more time to do some hiking around. Archery Tournament: On the way to Thimpu we managed to stop by a local Archery tournament. They were amazing! The archers were shooting at a target about the size of two pieces of paper from 200 meters away. Every time they hit it they did a nice dance. Lhakhang Nagpo (black temple): small temple. Not much to see, but we managed to sit for 10-15 minutes hearing beautiful chanting (click below to listen). To read about Thimpu and Punankha (part 3), click here.